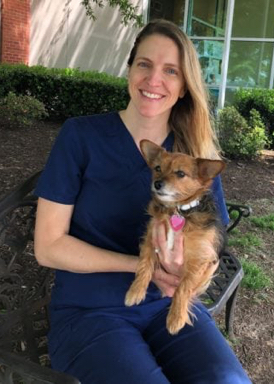 Dr. Leach completed an undergraduate degree in biological anthropology and anatomy and Biology from George Washington University and her veterinary degree from Atlantic Veterinary College in Prince Edward Island. She then completed her internship and residency at Cornell University. Dr. Leach is originally from Connecticut and currently lives in Greenville with two dogs and one cat. Her fiance is an equine veterinarian who is also pursuing a career in surgery. Outside of work, Dr. Leach enjoys hiking, running, and equestrianism.